Russia (MNN) — SOAR International’s short-term mission team is wrapping up their two-week trip to Russia today. They’ve been sharing Christ’s love in tangible ways on the heels of Orthodox Christmas. In Russia, Christmas celebrations begin on January 7 instead of December 25. As described here, the date is different because the Russian Orthodox Church uses the Julian instead of the Gregorian calendar. SOAR International’s Becky Dwinnell spoke to Mission Network News before she and a small team left to begin their “Stuff-A-Stocking” outreach. This annual distribution and outreach trip is part of SOAR International’s “Stuff-A-Stocking” ministry. First, believers sign up to sponsor a stocking. Each one “costs” $40, and sponsors can include a letter to be translated into Russian and delivered to a child with the stocking. In Russia, SOAR uses sponsorship money to purchase a small Bible, hygiene items, winter supplies, and small gifts. On its website, SOAR explains that purchasing items in-country is far more cost-effective than buying them in the U.S. and trying to ship them overseas. 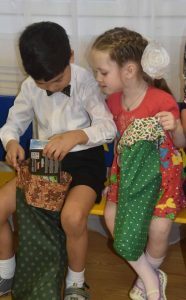 After arriving in Russia, SOAR’s short-term missions team works with their local church partners to stuff supplies and letters into hundreds of stockings. Then, the team and church leaders depart to distribute said stockings to orphans and needy children. 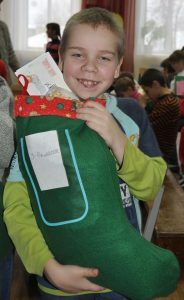 This year, they had approximately 200 stockings to deliver. As described on SOAR’s Facebook page, U.S. and Russian believers began their outreach on January 15 in St. Petersburg. 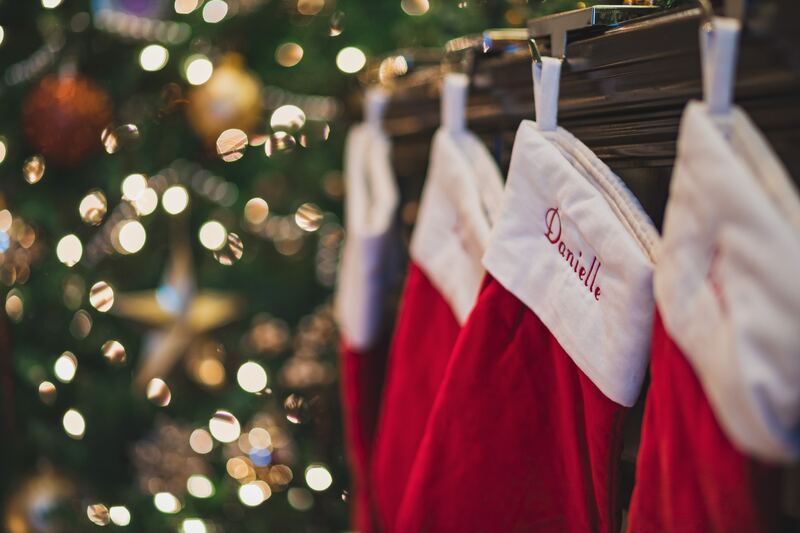 They brought stockings and joy to hundreds of children in orphanages throughout the city. At one home, 120 disabled children received the team with excitement. Four days later, the team traveled to Ryazan for the second “leg” of their journey. At each stocking distribution, kids see the compassion and love of Jesus on display through SOAR team members. Most importantly, they learn about Christ’s gift of salvation. We wish you were here to see all the joyful expressions on each face of these precious orphans as we share Christ’s love, stockings with Bibles and the true Gospel message with them!! A very special day! Keep praying for safety as we are driving long distances on snowy/icy roads. As the team begins their long journey home, pray for safety. Pray each child who heard the Gospel will understand their need for salvation, and will turn to Christ. 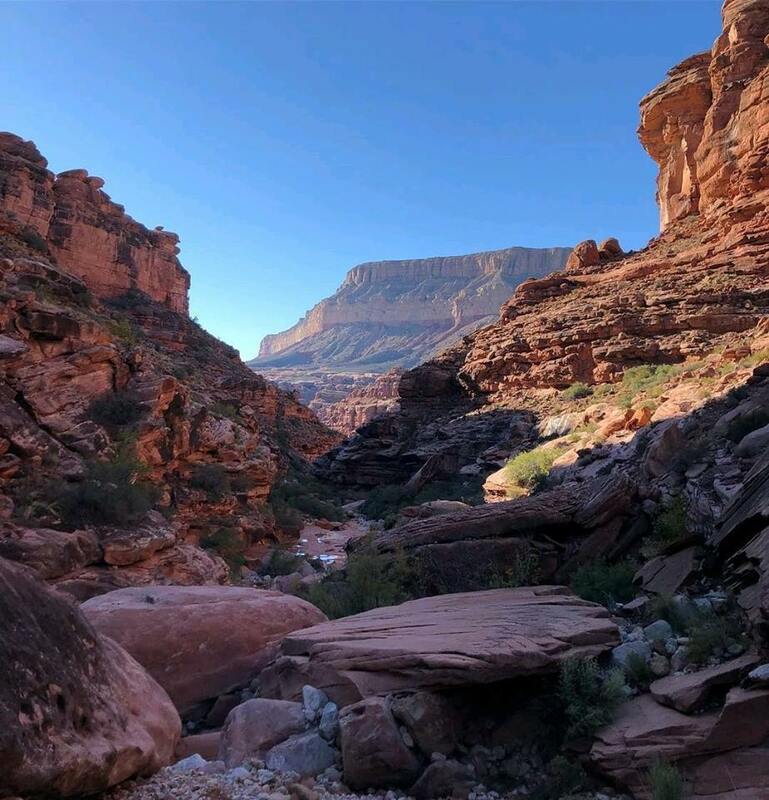 Header image by Luke Southern on Unsplash. Pray for safe travels as SOAR’s team begins the journey home. Pray each child who heard the Gospel through this outreach will understand their need for salvation, and will turn to Christ.